In this May 16, 1972, file photo, Rep. Shirley Chisholm, D-NY, talks during a speech in San Francisco while campaigning for the U.S. Presidency. It was the start of a national political career in which Chisholm, who died in 2005, fearlessly and relentlessly stood up and spoke out for such causes as civil and women's rights and that included a run for president just four years after her first federal win. "We should be inspired by the fact that she always went up against the status quo," said Rep. Yvette Clarke, whose Brooklyn district now includes a portion of the area that Chisholm was elected to represent and who introduced a bill earlier this year calling for a statue of Chisholm to be placed at the U.S. Capitol. "She was able to assert a moral political direction that galvanized people across this nation." A newspaper headline about the race in the days before the election simply referred to her as "woman." But Chisholm won the race by a 2-1 margin. She didn't let the institutional power her campaign faced rattle her, said Zinga Fraser, professor and director of the Shirley Chisholm Project on women and activism at Brooklyn College. Instead, Chisholm went with a campaign theme of "unbought and unbossed" and reached out to build a coalition of black women and others who had been excluded from the power structure for their electoral support. It was the same approach she took in 1972, when she ran for president as a Democrat and became the first black major-party presidential candidate, competing in 12 state primaries and winning 28 delegates. Chisholm "called herself the people's candidate because she wanted to bring on a new way to think about democracy, and who was privileged and who had the audacity to run," Fraser said. "We all just take so much strength and inspiration from her, to walk in her footsteps," said Kimberly Peeler-Allen, co-founder of Higher Heights, an organization that promotes the political power of black women as voters and candidates. "How she led, how she had no fear of speaking truth to power." Hayes, a Democratic teacher and first-time candidate who becomes the first black woman that Connecticut has sent to Congress, even referenced Chisholm in her victory remarks Tuesday night, acknowledging the 50th anniversary of Chisholm's Nov. 5, 1968, election. Letitia James, the New York City public advocate who made history Tuesday as the first African-American woman elected to hold statewide New York office as the state attorney general, said Chisholm's example matters all these years later because "we're fighting for the same people who don't have a voice at the table." 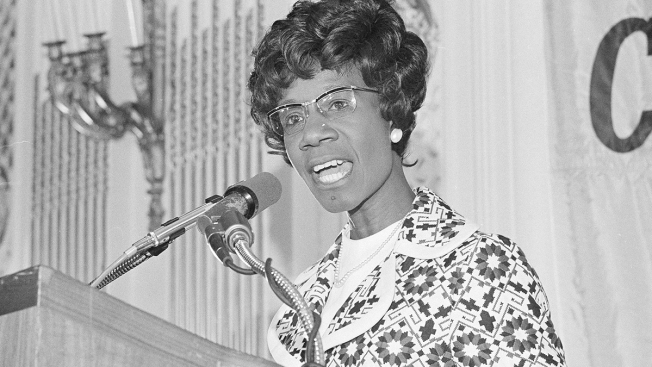 On Nov. 5, the 50th anniversary of Chisholm's congressional victory, Rep. Clarke and Rep. Hakeem Jeffries, who also represents some of what was Chisholm's district, announced legislation that if it passes would recognize Chisholm with the Congressional Gold Medal, the highest civilian honor bestowed by Congress. Lessons learned from Chisholm were clearly resonant for black women running for office this year, incumbents and challengers alike, those who won and those who didn't. Vanessa Enoch, 48, who ran unsuccessfully as a Democrat for the Ohio congressional seat once held by John Boehner that hasn't been out of Republican hands in decades, said she identified with Chisholm's determination to run, in spite of how obvious it was that the power structure had lined up behind her opponent. "I admire her courage, I admire her stamina to stick with the things that she believed in as she went into those places that were not welcoming to her, her wherewithal to continue to stand her ground and make sure her voice was not ignored," Enoch said. Chisholm left a legacy, she said, "that we don't allow the status quo to continue to be comfortable ignoring our voices and ignoring those things that concern us."